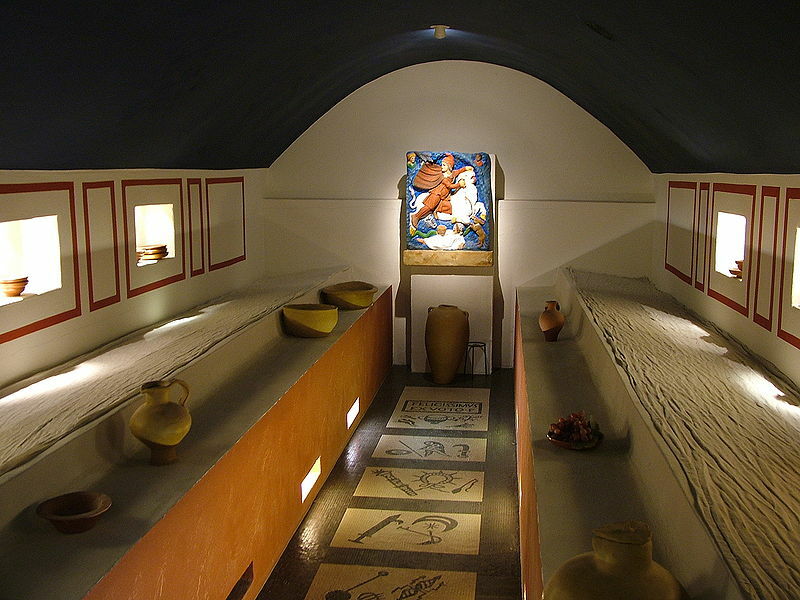 Reconstruction of the Interior of the Mithraeum of Felicissimus, Museumpark Orientalis, Groesbeek, The Netherlands. The Mithraeum of Felicissimus at Ostia Antica is one of the best preserved and most typical of the many Mithraea scattered across the Roman Empire (see photo below). All of the known mithraea are relatively small and this one is no exception. It was probably constructed in the third century A.D. At the west end is a semicircular wall-niche, starting at 0.70 meter from the floor, 1.00 meter wide, and 0.80 meter deep. A door in the west wall was blocked when the mithraeum was built. In the north wall are three openings, two of which were blocked with vittatum, while the third became the entrance of the mithraeum. Along the side walls are podia, the preserved height of which is 0.20 meter. An altar or niche must have been set against the back wall, but has disappeared. Between the podia, and between the door and the niche is a black-and-white floor mosaic, with depictions in panels created by black bands. Below the inscription is a krater flanked by branches, symbols of nature that is flourishing again through the blood of the bull that is killed by Mithras. In the remaining seven panels between the podia are references to the seven planets and seven grades of initiation. 1) In the first panel, near the entrance of the shrine, are a caduceus, a reference to the planet Mercurius, a raven, a reference to the grade Corax, the herald of the sun. Between the caduceus and the bird is a small vessel. 2) The left part of the second panel has disappeared. A diadem with a moon-crescent is a reference to the planet Venus. Below is a lamp, belonging to the grade Nymphus. 3) In the third panel is a helmet, symbol of the planet Mars. Above it is a lance, attribute of the grade miles. To the left is a bag, another reference to the Miles. 4) In the fourth panel is a bolt of lightning, symbol of the planet Jupiter. To the left is an object looking like a spade, but perhaps a simpulum or ladle. It is a reference to the carrying of fire and the grade Leo. In the centre is a sistrum, perhaps a reference to the Magna Mater, who is often seen with lions. 5) In the fifth panel is a moon crescent, symbol of the moon, Luna. Below is Hesperos, the evening star. To the left is a hamatus ensis or falcatus ensis, a sword, the symbol of the grade Perses. It is usually seen in the hand of Hercules fighting the Hydra and of Perseus killing Medusa (thus creating the Gorgo-head). Perseus was the hero of the Persians. It was a weapon that was characteristic of people in Asia. It can be seen on coins of King Mithridates of Pontus with Perseus, but also only the weapon is depicted, as symbol of Perseus. Below the star is probably a scythe, also belonging to this grade. It might be a symbol of the rebirth of nature, and of new life. 6) In the sixth panel is a crown with ribbons and seven rays, symbol of the sun, Sol. The grade that is under the protection of Sol is the Heliodromus. To the "runner of the sun" refers the object to the right, a whip for the golden and fiery horses. The torch to the left symbolizes Phosphoros, the morning star. 7) In the seventh panel is a pruning knife, attribute of the planet Saturnus. The Phrygian cap to the left belongs to the highest grade, Pater, the head of the Mithraic community. To the left are a patera and a magical object, a rabdos, an ebany stick, used to promote the initiates to a higher grade. 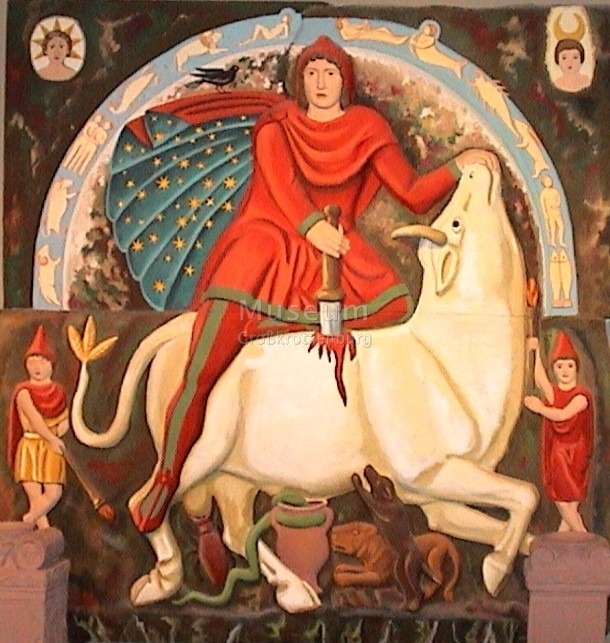 Through the seven planetary spheres, through the seven grades of initiation the faithful came closer to Mithras and Sol. Some could reach the eighth sphere, of endless light. From literary sources we know that the initiates wore masks and special clothes. 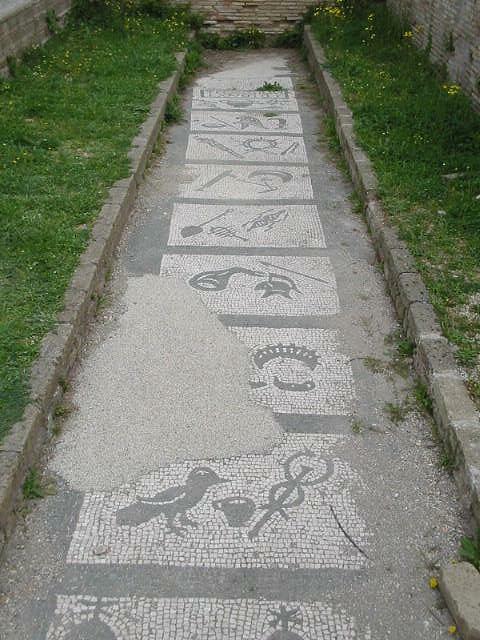 Individual photos of each of the seven mosaic tiles pertaining to the seven Mithraic grades may be found at this page.